I love going to the movies. It it the greatest escape to get lost in the fantasy of a story for two hours and not think about anything. 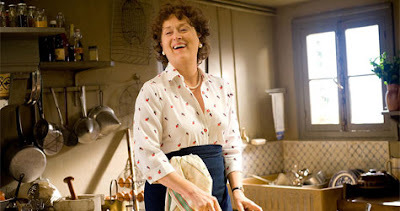 To be taken over by food, laughter and the delightful story of Julie & Julia was the perfect end to my weekend. If you are looking for a movie filled with joy and inspiration go see this film. Meryl Streep and Amy Adams are amazing. I will go as soon as I get a night w/o my kids. Thanks for the info. Ok I finally got away from the kids and saw the movie. I loved it. Now I may even buy her cookbook. Meryl Streep is awesome.